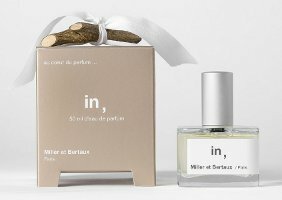 Niche line Miller et Bertaux has introduced In, the brand's ninth fragrance. In, follows Oh, ooOoh…oh, which launched in 2012. The notes feature elemi, ambergris, musk, lime, Atlas & Virginia cedar, ginger and kumbaru. Miller et Bertaux In, is available in 50 ml Eau de Parfum, and can be found now at First in Fragrance in Germany. MIller et Bertaux press releases never fail to disappoint! Yep! They crack me up…their interest in selling fragrance is so very minimal. This one in particular deserves a special award for being possibly the most un-google-able fragrance name ever.